The Kecoughtan Chapter encompasses the Monitor Merrimac District, including the Newport News/Hampton Area. The Kecoughtan Chapter meets on the third Wednesday of the month at 7:00pm at the First United Church of Christ in Hampton. The Nansemond Chapter encompasses the Colonial Trail District, including Surry, Isle of Wight, and Suffolk - including all towns adjacent or annexed. The Nansemond Chapter meets on the second Wednesday of the month at 7:00pm at Oakland Christian Church in Chuckatuck. The Nottoway Chapter encompasses the Siouan Rivers District, including the Franklin/Emporia Area. The Nottoway Chapter meets on the third Sunday of the month at 5:00pm at the Troop 17 Scout Hut on Fountain Street in Franklin. The Piankatank Chapter encompasses the First Colony District, including the James City/Williamsburg Area. The Piankatank Chapter meets on the third Thursday of the month at 7:00pm at the Williamsburg United Methodist Church in Williamsburg. 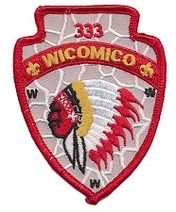 The Wicomoco Chapter encompasses the Chesapeake Bay District, including the York County/Glouchester Area. The Wicomoco Chapter meets on the first Thursday of the month at 7:00pm at Yorkminster Presbyterian Church in Yorktown.